Post written by Kristin Rush, Marketing & Communications Manager. History speaks to us from many sources. From words and pictures we construct images of the past. But no source is more alive than the legacy we can still see and touch for ourselves. And so it is with the Diamond T Fire Truck. The Diamond T was a mainstay of the Fort Collins municipal fire department from 1937 to 1963. 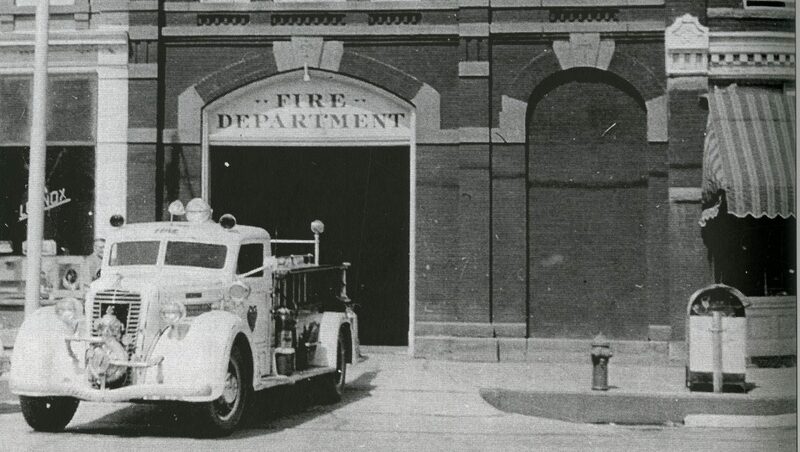 When the department’s original ladder truck was damaged in a collision in 1937, City Council approved the $1,234.85 necessary to purchase a Diamond T chassis. Without delay, the firefighters sprang into action. They repaired and remodeled the body from the wrecked truck and installed it on the new Diamond T chassis. As shiny as a newly minted coin, bearing 287 feet of ladder and 237 different tools, the Diamond T, Truck No. 3, found its home in the Walnut Street Fire Station. The Diamond T reached the end of its fire-fighting days in the 1960s when newer equipment pushed aside the old. It was sold to Lake County in 1963. In 1981, after years of languishing in the elements, the deteriorated Diamond T was sold to a private individual, who then sold it to the Fort Collins Museum for $685. 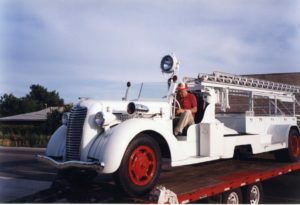 In 1994 the Fort Collins Museum and retired fire chief Ed Yonker [pictured below] initiated a campaign to restore the Diamond T, which was designated a Local Landmark in 1996. Local citizens, businesses and the Colorado Historical Society State Historical Fund all contributed to the effort to breathe new life into the Diamond T and restore it to its 1952 appearance. The restoration process was completed over the course of a year by the Colorado Artifact Conservation Center (CACC) in Ordway, Colorado. The truck was completely taken apart, rewired, repaired, rebuilt and rechromed piece by piece. 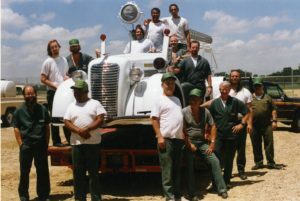 The restoration crew is pictured with the Diamond T below. Poudre Fire Authority Lead Mechanic, Jim Mirowski, rebuilt and installed the Diamond T’s engine. Although much of the original vehicle was preserved, its dilapidated condition required the use of some parts salvaged from other Diamond T’s. The tires and upholstery are reproductions. Our history tells us who we are, and preserving it sharpens our understanding and sense of direction. Preserving the Diamond T, saving it from near extinction, helps us stay in touch with a century of fire-fighting lore, and the small town ingenuity which found ways to adopt the Diamond T to ever-changing needs. The Fort Collins Museum of Discovery will continue to care for the Diamond T and all the other objects within its trust, preserving them for generations to come.